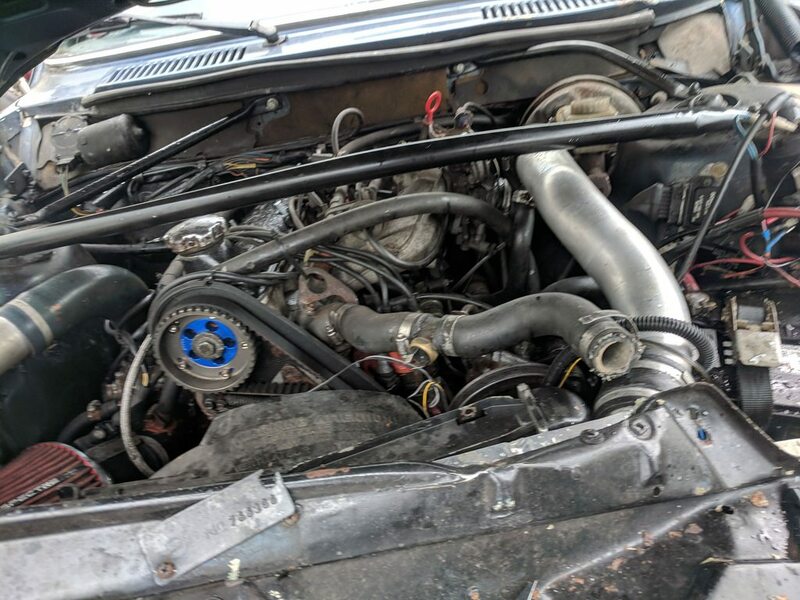 '93 B230f with Dave Barton LH2.2 EZK harness installed in an '82 240 diesel. Wired up all the ignition stuff and no spark. Has power to coil with key on. I cleaned connectors to hall and powerstage, tried spare coil, etc. I don't really know if these numbers mean anything, but testing resistance between coil negative and battery negative gets 0ohms with key on. (Cranking makes no change.) About 90 ohms key off. since you have power at the coil which you verified with a test light. Next goto the coil negative with the test light and under cranking see if it flashes. If it does. Then your rproblem is the secondary system like the coil wire distributor cap and wires. If no switching. then I would move to the power stage or ignition amp. Look at the input with a voltmeter and see if it has a fluctuating voltage on the input from the ezk when cranking. I forget which pin, look at the diagram. If it doesn't have the fluctuating input voltage and you verifiied the wiring. Then the icu or hall sensor are suspect. If their wiring is good then another sensor or icu should be tried. You can also verify the resistance of the hall sensor but I don't recall the value. That spec is in the manual. The output of the hall sensor can be checked with a scope. Maybe a meter on d/c volts would read the output too. No ignition triggering also means no fuel. Are ou sure your ignition components are getting power while cranking? I made this mistake, on my 1980 242 when I did my lh2.2 swap, you have to run everything off the blue wire, as that's the only one with power during both crank and run. Still getting power while cranking. I took the connector off the hall sensor and with key on none of the 3 pins have positive voltage. EDIT: Probed the hall sensor wires back to the EZK box and they're all fine. Bad EZK? 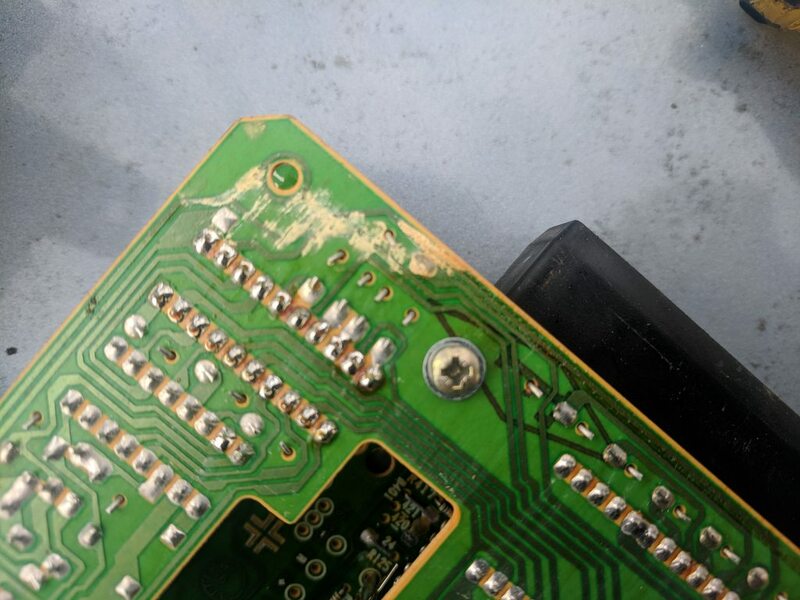 Last edited by Cwazywazy; 01-09-2019 at 03:39 PM..
That is horrible looking solder on the component pins. Good find! I've only had one out and out bad ezk but looking at that solder I'm surprised there aren't more failures. That's a weird way of making a PC Board. Normally, or at least anything in the last 20+ years, PCBs use Plated Through Holes with pads on both sides of the board. This means that there is a circular copper pad on both sides of the board and the hole is plated with copper to connect the two sides. The component wires are then soldered on both sides (or soldered on one side and it wicks through to the other side). The board you're showing is using non-plated-through-holes and doesn't even have a pad on the non-soldered side - it looks like only one side of the component wires is soldered, and the other side is bare. Still a good idea to get a bright light and a magnifying glass then painstakingly look at every solder joint, on both sides. Yeah, looks like a fail of the board manufacturing process and/or they were trying to save .00001 of a cent per board so they didn't put the pads on the bottom like you mention. lol. I got flashbacks from my last job looking at that board. It was my job to repair production fallout and customer rma repairs. It was mostly all surface mount low power vending and smart safe controllers. It was good while my eyes lasted but now too much of a commute after diabetic retinopathy. Thankfully my eyes are good enough now to do some car stuff again so it's been a much happier place to be. New EZK, still no spark..
bad hall sensor if there aren't any wiring issues. I took off the connector to the hall sensor and I'm still not getting power in any of the pins with key on. Roghly 30 megaohms between pin 2/3 of the hall connector. Pin 1 just has no connection to the other 2. Hall sensor power comes from the EZ117K. Check that +12V to the EZK box is good. Check too that the ground to the EZK box is connected to the manifold. Well. ****. Not the EZK, not the distributor, not the coil, everything I check seems to be fine. The power sources lit up a test light? No triggering with wiring good and verified? Then either the hall sensor or the box is bad. Hey, you are using an LH2.2 EZK? Did you verify the part number on the EZK is a 117 version? Because they look the same as the LH2.4 116 EZK but will never trigger and give you spark if you have an LH2.4 one in there. LH2.2 uses hall sensor. LH2.4 uses the VR crank sensor. It's a 117. The FPR clicks with ignition on since I put in the new one. There's power to the coil with cranking but no pulse. (Drops to about 9.5v under cranking and stays there.) It's definitely not the hall sensor and I really don't think it's a wiring problem (I spent awhile checking connections between EZK/powerstage/coil/etc plus cleaned grounds) so that just leaves the powerstage. I ordered a cheapie one off Amazon. I dunno how that would just break from the car sitting for a few months though. I'm sure it got rained on cause of the smooshed hood, but it's gotta be waterproof, right? The only damage to the engine electricals was the powerstage harness (Just kinda ripped the cover, didn't cut any wires) which I patched and tested. All wires go to where they should with no resistance. The car sat for like 3 months with the hood bent up and halfway open. So I bought this powerstage and with it installed I get no power to the coil. Old one gives power to the coil. So I'm pretty sure the old one is fine. Power on what terminal on the coil? Terminal 15 is the switched power. You should always measure 12v there. With terminal 1 being switched by the powerstage. Terminal one voltage will vary with the circuit but it is a fast switched voltage which you can catch with the test light. Maybe a good time to test with Art's hall sensor test setup? I think it's on cleanflametrap site. Send him a PM about it. I still stick with no triggering means the hall sensor or box if the wiring is verified. If you still aren't seeing swtiching on the input to the power stage then you know the triggering and spark control are suspect. Well a varying voltage like that is probably triggering. But the test light is more accurate for that test. If you see triggering on terminal 1. Then the secondary part of the sytem probably has the issue. The coil output, coil wire, distributor cap, rotor are all in the secondary part of the system. Measure the coil secondary resistance, too. I measured resistances of both coils I have, my spare coil turned out to be completely boned and the one in the car is a bit out of spec. I got about 10kohms on the secondary.